A great thing about having a garden and putting things by is the summery reminder certain flavors can bring back to you in the middle of winter. In late September, before the basil was nipped by frost, I made a few batches of pesto. This included a little Thai Basil Pesto which we enjoyed that very day. Today we were able to enjoy the taste of late summer with some of the Genovese Basil Pesto I had made. 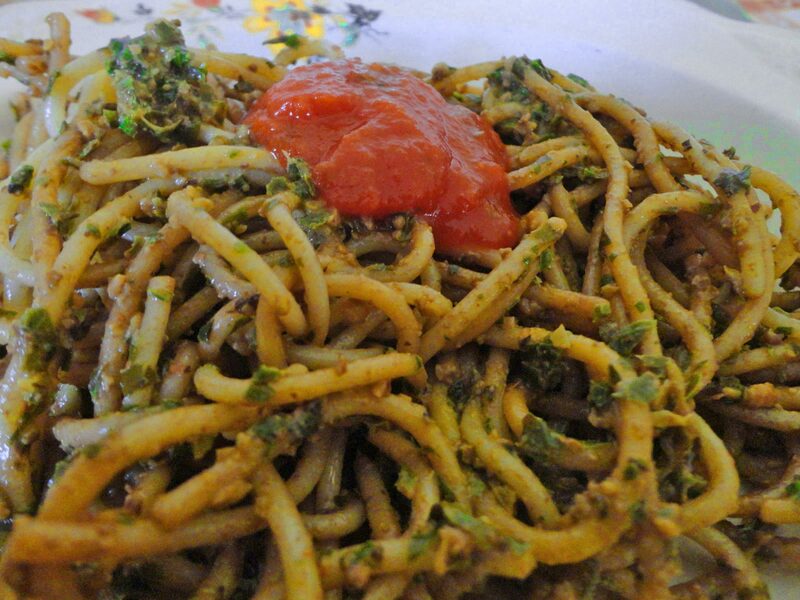 As I mentioned before my Thai Pesto recipe, I used the recipe from Vegan with a Vengeance but you can find other vegan pesto like Post Punk Kitchen’s Besto Pesto, Whole Foods Market’s Vegan Pesto, or Vegan Spoonful’s Vegan Pesto Sauce. A warm bowl of Sunny Pesto on some noodles and a dollop of marinara sauce is just what a soul needs in the middle of a February cold snap. Posted in Meals at Home and tagged Thai Basil Pesto, thai pesto. Bookmark the permalink. vegan, runner, blogger, mom, model, artist, tarot reader. Thai basil is my favorite type of basil. The flavor is just so unique. And I can’t find it in local stores, so we HAVE to grow our own – not that I’m complaining ;-). But any kind of pesto will do. So easy and simple yet so full of summery flavor. You obviously froze your pesto. You know, I never thought about doing that when I make a big batch. Right now I have lots of basil! Yes ma’am, I freeze small portions in snack sized baggies so they thaw quickly and are great for just a serving or 2. Enter your email address to subscribe to Bacon is NOT an Herb and receive notifications of new posts by email. Recent reviews by Pennsyltucky V.